"A classic Pennsylvania Dutch pie made with molasses, brown sugar and butter." In a medium bowl, dissolve the soda in the molasses and stir until it foams. Sir in the boiling water and pinch of salt. In a separate bowl, mix the flour, cinnamon, brown sugar and butter into crumbs. Pour 1/3 of the molasses mixture into the unbaked crust. Sprinkle 1/3 of the crumbs over the molasses mixture and continue alternating layers, finishing with the crumbs on top. Bake in preheated oven for 30 minutes, or until the crumbs and crust are golden. This is the best kind of pie ever. 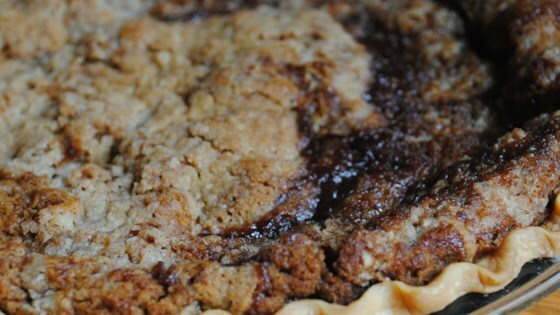 You have not lived until you have had Shoofly Pie. VERY sweet! But entirely delicious and easy to make!